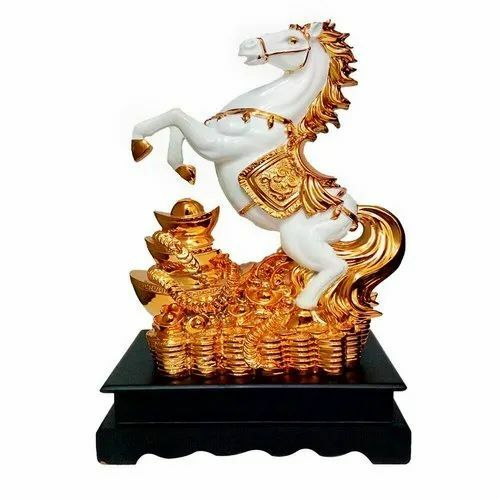 Gold Plated with Wooden Base Antique Horse Statue Showpiece Vastu Decorative Figurine Home Interior Decor Item Feng Shui Love Couple Table Decoration Idol Handicraft Pet Animal Figure Gift Items. Incepted in the year of 2017, we, Moksh Creations, come across as one of the reputed manufacturer and exporter of a beautiful range of Antique Statue, Polyresin Statue and Marble Statue that are available in various sizes, designs, colours and patterns as per the specifications of our esteemed customers. These products are fabricated using high-grade material and advance technology to ensure its superior quality. Our range of these products is tested on various required parameters by our industrial experts before making its final delivery to our clients. We are well acknowledged among our clients located across the globe for offering these product ranges at competitive prices and within a time frame been assigned to us. The product range offered by us is made as per the international quality standards. Working under the supervision of our mentor, Mr. Manoj Sharma ( Owner ), we have tough the height of success. His vast knowledge and industry experience make him an expert in this business. His able guidance helps us in matching up with the requirements of the market.